In concept, it was to include 12 storage buildings ranging in size from 3,000 square feet to 9,375 square feet for a total of 50,925 square feet, and an office building of 686 square feet. All building exteriors facing Hog Mountain road were to be brick facade. In preliminary design, it was to be eight storage buildings ranging in size from 800 square feet to 17,400 square feet for a total of 50,810 square feet, and an office building of 685 square feet. 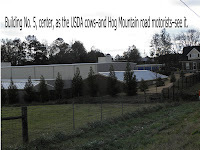 What was built as Oconee Safe Storage at 1711 Hog Mountain road was eight storage building ranging in size from 800 square feet to 34,800 square feet for a total of 68,210 square feet, and an office building of 1,270 square feet. The second floor of built building number 5, shown on the preliminary site plan of July 27, 2007, as a single story tall and 17,400 square feet, is two stories tall and has 34,800 square feet. It does not have a brick facade on the rear, but it is clearly visible from Hog Mountain road. According to B.R. White, Oconee County Planning Department director, the important discrepancy was not between the concept plan submitted by Beall & Company for the site with the original rezone request in October of 2006 and the preliminary site plan submitted in July of 2007. The key discrepancy was between the preliminary site plan and the buildings actually built. Code enforcement, not his office, discovered that discrepancy when doing inspection before the occupancy permit could be issued, White said. Concept plans are just that, White told me when I visited his office on Friday. According to White, the site plan often is quite different, as Ken Beall told the Board of Commissioners on Dec. 2, when Oconee Safe Storage was back before the commissioners because of the discrepancy. The BOC granted a rezone and special use approval. This means that Oconee Safe Storage will get to use the extra space it built. It will be required to put brick facade on the top of building number 5. The public may assume that if a developer proposes to build 12 storage building and an office that the final project will include 12 storage buildings and an office. What the planning office is focusing on is the total square footage, however, not the number of building, White said. Commissioner Chuck Horton made it clear at the Dec. 2 meeting that he felt the discrepancy between the concept plan and the buildings actually built was too great, and he said Beall should have come back before the board with new plans before building what he built. According to the Unified Development Code for the county, "no building permit, other permit or certificate of occupancy shall be granted except for uses or structures conforming substantially with the Concept Plan and related documents submitted with the application." The BOC has struggled frequently with what "substantial compliance" means within the last year and a half–a relatively slow period in terms of rezone activity. On Oct. 7, 2008, the Board debated at length whether the developer of the Epps Bridge Centre on Epps Bridge Parkway could develop the center in substantial compliance with the submitted concept plan if the state did not build the planned roadway to the shopping mall. It concluded developer Frank Bishop would not be in compliance, so it rewrote the enabling ordinance to stipulate that he could not start work on the shopping mall until the state let the contract for the roadway. The state let that contract in June. Bishop at that time also did not have his permit from the U.S. Army Corps of Engineers for filling and piping the streams and wetlands on the site or his variance from the state of Georgia for violation of the buffers on those streams. The Board was willing to ignore this issue entirely. Yet Bishop could not have built his shopping center in "substantial compliance" with the concept plan had he not gotten the permit and variance. He got his permit from the Corps in January and his variance from the state in April. On Jan. 6 of this year, the Board rezoned property at the corner of LaVista road and U.S. 441 owned by Fred Gunter Property LLC for office-institutional-professional use. The concept plan that had been submitted was for a shopping center, which requires a business classification. No concept plan at all had been submitted for the office park. White told me on Friday that anyone who develops the site with the current rezone classification (O-I-P) simply will have to meet the UDC requirements, since there is no concept plan for the site to use as a guideline. About an hour later at the Jan. 6 meeting, the BOC debated whether a second rezone–for a shopping center on U.S. 78 at Dials Mill road–would meet the requirement of being in substantial compliance with its concept plan if a proposed roadway inside the development could not be built. The developer needed approval of a pipeline company before it could build the roadway, and it did not have the approval. The board ultimately included in its rezone language a stipulation that the developer would have to come back to the board with a new plan if it did not get permission for the roadway. At the Feb. 3 meeting of the BOC, this issue came up again when state Rep. Bob Smith was before the board because he needed to modify the concept plan for the subdivision he has developed on Porter Creek drive off Barnett Shoals road east of Watkinsville. White explained at that time that Smith already had built as many houses as the original concept plan allowed. If Smith wanted to add more lots and houses, he needed a new concept plan, White said. The board approved a new concept plan for Smith’s subdivision. Despite these inconsistencies in how the concept plan is viewed by the commissioners, the lesson for citizens of the Oconee Safe Storage rezone is clear. What you see at the public hearing on the rezone is not necessarily what you are going to get. To know what you are going to get you’ll have to monitor processes and activities currently carried out away from the public spotlight.